Location: Between the Schuylkill River and 38th Street; between Chestnut Street and University Avenue. The University of Pennsylvania is one of the 12 prestigious Ivy League colleges, and is the only one in Pennsylvania. Alongside Drexel University and the University of the Sciences, it forms University City, one of Philadelphia’s most popular neighborhoods. 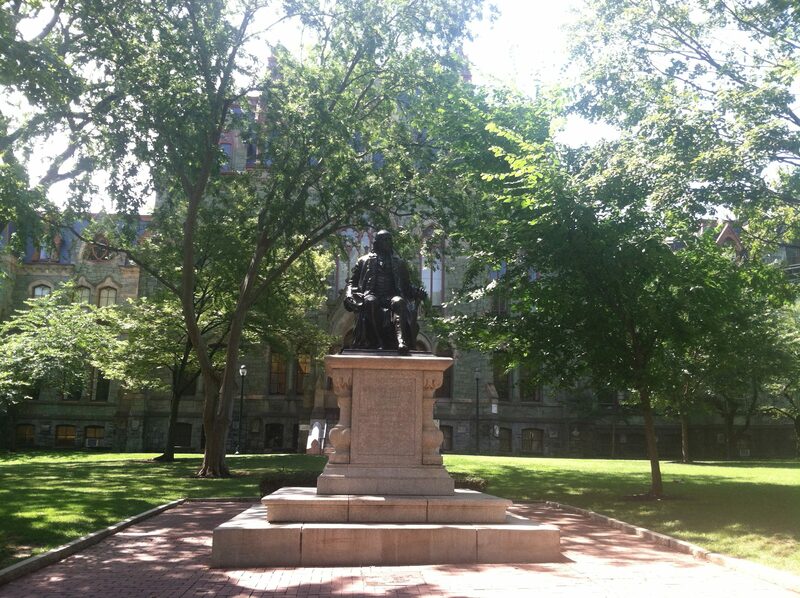 One of the oldest universities in America, Penn was founded by Benjamin Franklin in 1741. It is widely considered to be the first liberal arts college in America, and claims to be the fourth oldest overall (Harvard, William & Mary, Yale.) Franklin’s ideas for the “Public Academy of Philadelphia,” as he called it, were innovative, as most of his ideas were. Penn was the first to take the title of “university,” and the first to establish a medical school. Penn has grown over the years, with almost 25,000 students in the present day. For a visitor, the campus is notable for it’s architecture, ranging from classic buildings by Furness to the modern buildings on the south side of the campus. The Fisher Fine Arts Library, located on the eastern side of the main quadrangle, is one of the best works of Philadelphia architect Frank Furness, whose work also includes the Pennsylvania Academy of the Fine Arts. The library houses the Arthur Ross Gallery, which has rotating exhibits on various topics. Penn also has its stadium and arena, Franklin Field and the Palestra. Franklin Field is the second largest stadium in the city, seating nearly 53,000. (Lincoln Financial Field seats 69,000) It was the home of the Philadelphia Eagles from 1958 until their move to Veterans Stadium in 1970. It is the current home of Penn Quakers football and the world famous Penn Relays. The Penn Relays have been held every year since 1895 and are the largest track and field meet in the country. The Palestra is home to the Penn basketball team, that plays Division I basketball in the NCAA. It is also one of the Big 5 in Philadelphia, alongside La Salle, St Joseph’s, Temple, and Villanova. Each one of those four teams plays one home game at the Palestra annually.